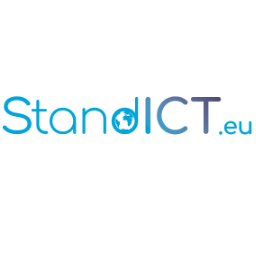 StandICT.eu, “Supporting European Experts Presence in International Standardisation Activities in ICT”, addresses the need for ICT Standardisation and defines a pragmatic approach and streamlined process to reinforce EU expert presence in the international ICT standardisation scene. Through a Standards Watch, StandICT.eu will analyse and monitor the international ICT standards landscape and liaise with Standards Development Organisations (SDOs) and Standard Setting Organisations (SSOs), key organisations such as the EU Multistakeholder Platform for ICT Standardisation as well as industry-led groups, to pinpoint gaps and priorities matching EU DSM objectives. These become the topics for a series of 10 Open calls focused on priority domains and a continuous cascading grants process, launched by StandICT.eu from March 2018, providing support for European specialists to contribute to ongoing standards development activities, and attend SDO & SSO meetings. Find out more about the 2nd StandICT.eu Open Call below and follow the instructions to apply. The 10 cycles of Open Calls will cover key ICT standardisation priority areas with further focus on specific vertical sectors. The 2d Call topics follow the priority areas outlined in the 2018 Rolling Plan for ICT Standardisation. View below the outline of the priority topics for the 2nd StandICT.eu Open Call. Note that proposals need to closely adhere to one or more of the topics identified. StandICT.eu will run 10 Open Call cycles. Each call will be open for 60 days and will be followed by a 30-day evaluation period. Evaluation: Proposals evaluation will be done by a pool of independent evaluators. The estimated duration is 30 days. Notification: Applicants will be notified of the outcome of their applications by the 3rd of September. Successful applicants will be contacted for contract signing and funding. Potential applicants are standardisation specialists, defined as professionals with proven expertise and experience in standardisation activities e.g. previous contributions to standards developments, participation in various SDO groups working, previous or current chairs etc in the respective priority area. The StandICT.eu Calls are open to applicants from both public and private sectors in EEA member countries and Switzerland, industry and service companies including SMEs and start-ups, academia and research, and national and European associations, including NGOs representing consumers interests. are not receiving support from other instruments (PPPs, EU or national R&I projects) for the proposed activities, and are not being funded from other sources for an identical activity. Please note that neither the maximum funding per submitted proposal can be higher than indicated in the respective funding range nor can the contract duration of a proposal exceed the duration indicated above for the selected proposal type. In order to be eligible to apply for this grant, applicants must reside/work in Europe. More information is provided under the Expert Profile block. Expertise of the applicant in standardisation, e.g. previous contributions to standards developments, participation in other groups working on architectures, APIs, guidelines in the respective priority area. The proposals final scoring and the ranking final score will be automatically determined by averaging scores provided by the 3 independent evaluators.